Is Macedonia the Troll of the Balkans? From your icon and is given to us from the earth. On the twenty-first the Icon of She Who Is Great With Child From God appeared in the earth. The terrible earthquakes that shook Thessaly on 30 April 1954, the feastday of the Life-Giving Spring, are unforgettable to its oldest inhabitants. This day was particularly memorable for the villagers of Xyniada, and even more so for Athanasios Syros, who saw with his very eyes the Most-Holy Theotokos. Athanasios Nicholas Syros was eight years old then, and while playing on Friday afternoon along with other children on the mountainside, he saw in front of him a barefoot woman dressed in black doing prostrations. And while the ground at that spot was dry, the prostrations made by this unknown woman dressed in black made the ground soft and it sank like dough. At the three points where this unknown woman made these prostrations, the place exuded a sweet fragrance. Then young Athanasios told the other children: "Children, look at the grandma doing prostrations." He called her grandmother because she wore black clothes, like almost all the grandmothers in the villages wear. None among all the other children could see her however. Then the kids went running to the villagers to announce what Athanasios saw, so they could quickly come to confirm the event. Indeed Athanasios repeated for them that he saw an unknown woman doing prostrations at the same area. The villagers could not see anything and asked him insisting to tell them where he was seeing the woman dressed in black. Though the young Athanasios repeated the same to them, they could not see anything. All they could discern was the smell of a sweet fragrance emanating from the point where the little boy said that he saw the unknown woman dressed in black doing prostrations. That same night the unknown woman made her appearance in Athanasios' sleep, who slept next to his parents on one side and his other siblings on the other. This time she had a bright crown on her head and he was a little bit frightened, asking her: "Grandma, who are you? And what do you want from me? I am afraid!". And then the black dressed woman told him: "Do not be afraid, young one, I am the mother of the infant Christ, Whom you love so much, and He sent me to reveal to you that you have a clean heart and pure soul, and that at the central point you saw me marking, they should dig there and my icon will be found. That spot shall become a place of worship, and a church is to be built, a holy place." With these words the Panagia disappeared from before young Athanasios. In the morning Athanasios told his family in detail about the second appearance of the Theotokos and begged them to dig at the spot mentioned by the Panagia. Unfortunately, the reactions of the villagers were not favorable for the young Athanasios. Nobody could believe everything he narrated was true, and many times they browbeat him away with insulting phrases! Such is always done by people who do not believe. Approximately the same was done to the Lord, Who said: "Blessed are you when they insult and persecute you and speak against you any evil thing ... Rejoice and be glad, because your reward is great in heaven" (Matthew 5:11-12). All these reactions of the villagers however were unable to shake Athanasios. He gathered stones and built himself a small chapel where the Panagia indicated. There he placed a small icon of the Panagia, and he would go there every day, morning and evening, to light the oil lamp and pray to the Most-Holy Theotokos. In his constant entreaties to dig there at the spot indicated by the Panagia, at one point some villagers gave in. These actions, however, were isolated and without any effect. Eight years of indifference by the villagers passed, but this stopped when a deadly disease befell the animals of the village. They began now to think seriously whether the illness of their "livelihood" was God's punishment for their lack of faith shown to the words of Athanasios. They began to make supplications to the Theotokos to forgive them and exempt them from the evil which befell them. Thus the death of the animals was the cause of the villagers to return closer to God. In early June of the year 1962 a bulldozer came to Xyniada to dig open the streets of the village. The residents then begged the operator, that upon finishing the digging, to help dig at the spot mentioned by Athanasios as suggested by the Panagia where her icon was to be found. The operator of the machine, however, named Elias Saltas and came from the village named Stavros Lamias, did not want to dig and even reacted violently to the persistent requests of the villagers. 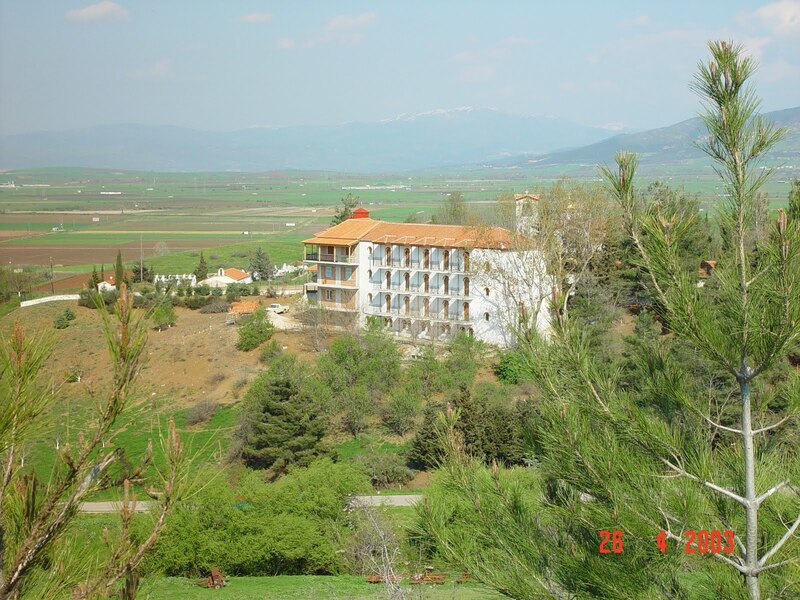 Then stepped up another resident of Lamia, Spyros Houliaras, an official of the Ministry of Finance who had heard from his mother concerning the appearances of the Panagia. Mr. Houliaras heard of the reactions of the driver, and called a meeting of the leaders of the community, namely the president of the village, the teacher, the priest, the police and the church council, and together they went and asked the operator, whom they eventually convinced. The machine began to dig and remove soil at the indicated spot and everyone had gathered, waiting anxiously. The operator after the first and second trench had no result. He began to blaspheme and tried a third time without success again. The machine stopped. 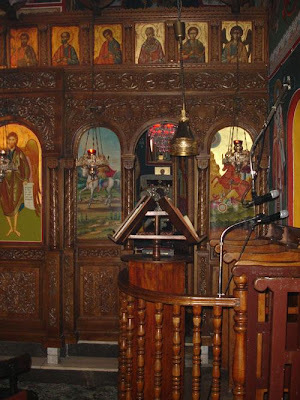 Then the policeman who was close saw next to the blade of the machine near the root of an oak the icon of the Panagia. What happened at that point is indescribable. Everyone who was there fell on their knees and venerated the holy icon of the Panagia and asked with tears in their eyes for her grace. Some ran and struck the bell to alert the other residents who were in the fields. Others ran and embraced the sixteen year old Athanasios and asked him to forgive them for their contempt and unbelief. The machine operator fell in tears, venerated the icon, and begged the Theotokos to forgive him. It is said that by resorting to the grace of the Panagia, with a warm faith, he was healed of a stomach ailment from which he was tormented until then. 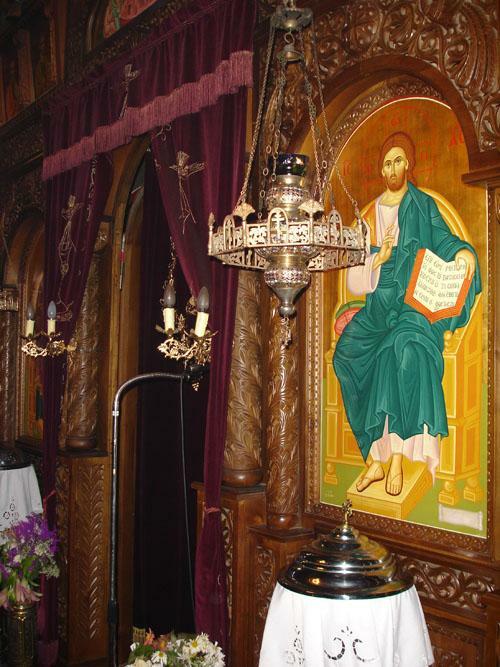 The miraculous icon of the Panagia was hidden at a depth of a meter and a half for centuries. 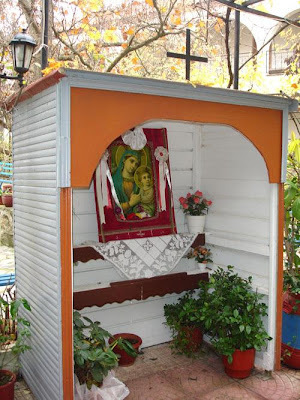 It is small and bears the inscription "Mother of God Eleousa". According to expert opinion, the icon seems to belong to the era of iconoclasm. It remained in the soil however so many centuries without anything wrong with it. When the grace of God wills, the destructible becomes indestructible and the mortal immortal. Today the icon of "Panagia Eleousa" is covered with silver and gold and placed in a beautiful shrine. The offerings of the faithful who are troubled and receive grace decorate the entire surface of the icon. The pious pilgrims offered whatever they could for a small church to be built to serve the spiritual needs of the faithful who resorted to the Panagia. 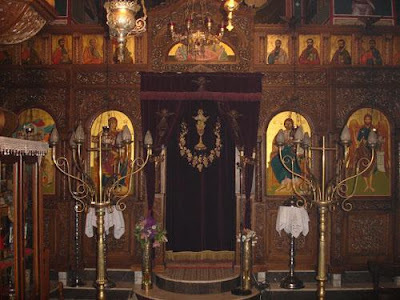 The chapel was built, and at the root of the oak, where they found the icon, they placed the altar. This small church however could not serve the needs of the ever increasing pilgrims. 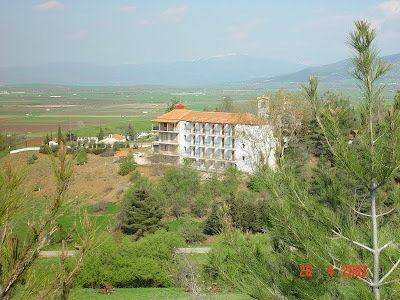 That is why Metropolitan Damaskinos of Fthiotida in November 1965 laid the foundation for a larger church, which with the assistance of the faithful pilgrims ended in August 1966. 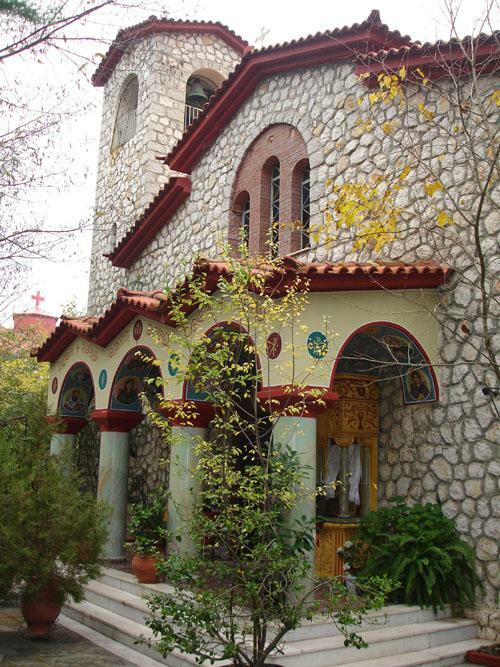 Athanasios, now known as Father Athanasios, secured by personal efforts to complete the construction of the church. He loved this project so much that he built a magnificent Monastery. The dome and walls of the church were frescoed. In the eastern part of the Monastery was built the Abbot's residence and a few cells. The Abbot is Fr. Athanasios. The day of consecration was 21 June 1972, ie, the same day they found the icon. On June 21 Great Vespers was celebrated by the then chancellor and now the former Metropolitan Agathonikos of Mesogaias and Lavreotiki. The next day the great celebration of the consecration by Metropolitan Damaskinos of Fthiotida took place, accompanied by many priests and before a large number of believers. The Holy Shrine celebrates twice a year: on the day of the discovery of the icon on June 21, and on August 15 for the celebration of the Dormition of the Theotokos. Lemonia Kokkini, from the village Agrapidia of Domokou, in the year 1963, became demon possessed at mealtime. The demon constantly annoyed her and would not calm down. Her parents, desperate, having brought her to many doctors, called on the Panagia Eleousa. The girl did not speak but made inarticulate cries. During the night a change in behavior was witnessed and the girl after a few days became absolutely tranquile. The event became known throughout the region, and the people ran to the miraculous icon of the Panagia to offer thanks. (From the newspaper National Struggle of Lamia, 3 January 1963). From the village of Xyniada in Domokou, the son of Vaios Polymeros, named Stavros, at dinner became blinded. His parents were astonished by what happened and placed their hopes in God. They grabbed their blind son and went to our Panagia who is Great in Grace. A Supplication Service took place and towards the end of it vision returned to the child. The parents, wanting to thank the Panagia, dedicated to the Monastery the gate of the garden. 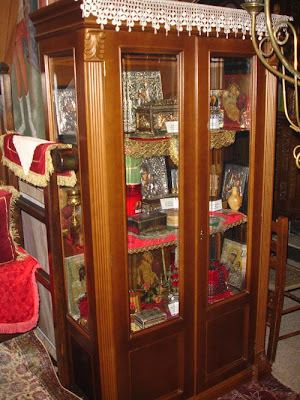 Two childless married couples from Karditsa, whose surnames were Giannakis and Kafetzis, begged the Panagia to give them children. They asked the Abbot of the Monastery to pray a Supplication Service for them. The Abbot blessed them, and told them that the Panagia will do the miracle. The following year the two couples, holding their children in their arms, went to the Panagia to thank her and have them baptized. From then till now over 1,500 couples have sought assistance to bear children, and all baptized their children in the Monastery. Several years ago, a pilgrim left a lit candle in the church. The Abbot, forgetting the lit candle, locked the church. As the candle burned, it reached the point where it was attached to the candelabra and fell down, so it started burning the carpet. At midnight the Abbot, while sleeping, heard knocks on the window and a voice saying: "Wake up, the church is burning." Immediately he ran to the church, and he fought the flames alone, extinguishing the fire without seeing anyone beside him. 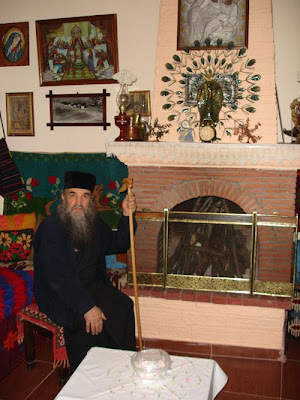 It was the Panagia who informed the Abbot and saved the Monastery from a sure fire. The burnt carpet still exists. Pilgrims from Athens heard about the discovery of the icon and decided to visit and to venerate. Arriving at the 22nd km after Lamia, they did not know where to go. Then in front of the driver who was in despair, there appeared in front of the bus a black bird, which showed him the way to the Monastery until the gate of the enclosure. Then the bird disappeared. All the pilgrims proclaimed the miracle of the Panagia and still proclaim it today. From Ambelia Farsala two couples came to give thanks for the grace they received by attending an all-night vigil. The first couple had a child on whose cheek was seen an incision that reached up to his mouth. The diagnosis by the doctors was cancer. The believing parents brought the child to the Monastery for the vigil. While the child was asleep, he was healed. Waking in the morning his mother saw that the cut was gone. The second married couple from the same village had a deaf-mute girl. Her mother constantly prayed to the Panagia and finally in desperation said: "My Panagia, either give her a voice or take her, as I cannot see her suffer." The Panagia did the miracle and the girl spoke. The first word she said was "mama" ("mom"). Panagiota Psihogios from Agia Paraskevi of Lokridos, now residing in Athens, confesses the miracle of the Panagia who cured her of cancer. 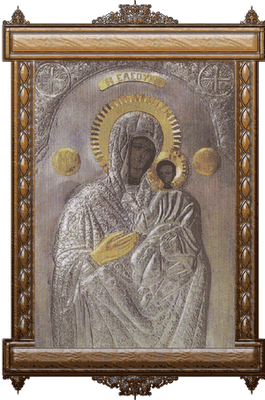 The miraculous icon was found in 1962. The church started being built in 1965. North of this was built a temporary hut with three rooms. In one lived the Abbot, in the other builders, and in the third was placed the icon along with the sacred vessels. 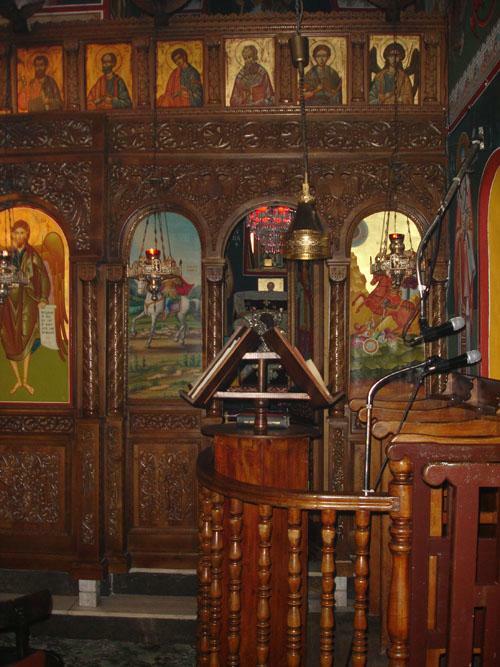 During the night the workers heard noises, censors and chanting coming from the room where the Panagia was kept. They became very frightened and wanted to leave before finishing the building of the church. The Abbot reassured them and told them not to fear because the chants were coming from the Panagia. This strengthened their faith and they remained until the completion of the church. A resident from Karditsa told the Abbot that for three nights a woman with black clothes took him and brought him to a big door. The third time he found the courage and asked her where she was leaving him, and she replied "at the Sacred Monastery of Panagia Eleousa in Xyniada of Domokou." Entering the Main Gate of the church, to the right, surrounded by balusters for safety reasons, is kept the Holy Icon. Due to lack of money there wasn't a door for the balusters. Then the Panagia appeared to Mr. Karahalios, a resident of Lamia, and asked him to go fix the door. Surprised Mr. Karahalios asked to know which Monastery, and she replied "at the Sacred Monastery of Panagia Eleousa in Xyniada of Domokou." 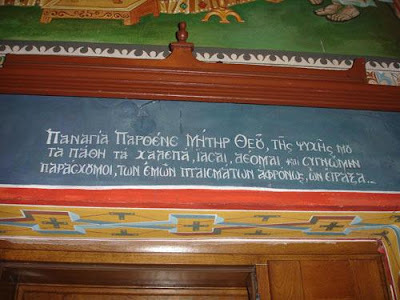 The above text was based on the book by Archimandrite Panteleimon Poulos, preacher of the Archdiocese of Athens' "Holy Monastery of Panagia Eleousa". The miracles were recorded by the theologian Dr. Sophia Tsagkali from narratives by the Abbot and pilgrims on August 18, 1998. To date, there have been countless miracles. Monk Gerasimos Mikragiannanitis composed a Divine Office to commemorate this miraculous discovery. Your divine icon Eleousa All-Immaculate one, hidden under the earth, you wondrously revealed, wherefore the pious of Xyniada, fall down before it all-reverently, gathering the gifts of your grace, and with longing cry out: Glory to your wonders Pure one, glory to your goodness, glory to your consideration towards us O Lady. Your divine icon, we celebrate together spiritually, singing hymns O Virgin to your grace, and from our souls O Theotokos we cry to you: You are the refuge of the faithful. In your venerable Icon does the village of Xyniada truly rejoice, O Maiden, and take recourse in it; receiving endless strength, and mercy and grace, the faithful glorify you.